Freiburg has hourly high speed train connections. You can find further information on any train connections on the website of the Deutsche Bahn (German railway company). Frankfurt Airport: You can then reach Freiburg by train, starting at railway station "Frankfurt(M)Flughafen". The ride takes about 2 hours. Zurich Airport: You can then reach Freiburg by train, starting at railway station "Zurich Flughafen". The ride takes about 2.5 hours. EuroAirport Basel Mulhouse Freiburg: Not directly connected to the railway system. There are connections to the railway station in Basel ("Basel SBB") by public transport (bus line 50). Additionally, a shuttle bus (AirportBus) operates between EuroAirport and Freiburg. Strasbourg Airport: Not directly connected to the railway system. A shuttle train operates between Strasbourg Airport and the railway station in Strasbourg. Freiburg is located at the motorway A5. If you are coming from the south (Basel), simply follow the signposts. If you are coming from the north, follow the signs for Karlsruhe and Basel. 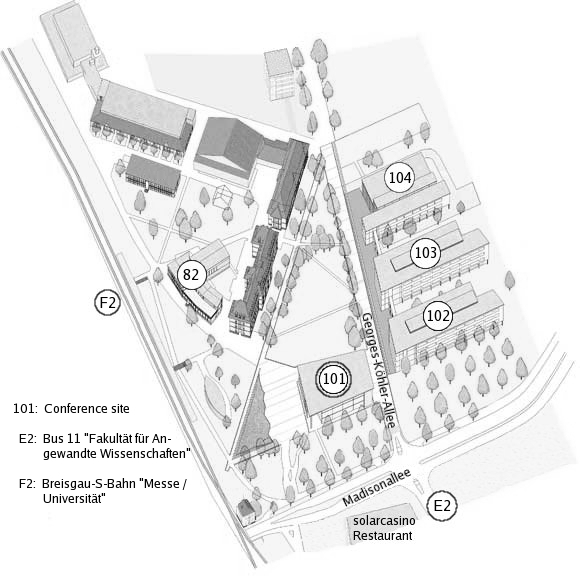 The conference is held in the lecture halls 26 and 36 of building 101 at the "Campus am Flugplatz" (campus at the airport, see map of the campus), address: Georges-Köhler-Allee 101, 79110 Freiburg, Germany. We recommend three ways of getting to the conference site by public transport: bus lines 10 and 11 and the Breisgau-S-Bahn (see the map below for the station next to your hotel). Bus 10: Get on at station "Siegesdenkmal" (D1) or "Fahnenbergplatz" (D2) and get off at station "Bärenweg" (D3). Walk through the street Bärenweg and enter the campus through a small underbridge. Follow the signs to building 101. Bus 11: Get on at station "Hauptbahnhof" (E1) (meaning "central railway station") which is located at Bismarck Allee, approx. 200 m to the south of the main entrance of the railway station. Get off at station "Fakultät für Angewandte Wissenschaften" (E2) which is opposite to the campus. You will immediately see building 101. Breisgau-S-Bahn: Get on at station "Freiburg-Hbf" (F1). Note that this is on track 5 of the main railway station. Get off at station "Messe / Universität" (F2). Take the stairs to the campus and follow the signs to building 101. Take the bus line 10 or the Breisgau-S-Bahn (see above). Coming from the motorway A5, take the exit 62 Freiburg Mitte direction Freiburg / Titisee-Neustadt. You are on the road B31a. Take the exit FR-Bischofslinde / FR-Weingarten and turn left into the Berliner Allee. After approx. 2 km turn left into the Georges-Köhler-Allee.